It's the season of giving thanks, and I want to personally start the month off right by thanking each and every one of you- my lovely readers! Thank you for taking the time to stop by and read my thoughts! Thank you for your kind words! Unfortunately, I cannot always respond to every comment (especially those no-reply comments! ), but I read every single one and your kind words mean a lot to me! Words of affirmation is my love language, and I certainly feel the love. Thank you for sharing your experiences with me! I love hearing your stories just as much as I love telling my own! Thank you for entering giveaways! I love offering giveaways and giving you chances to win, so thank you for taking time out of your busy lives to stop by and enter! Thank you for your patience! If you've won one of said giveaways, you know that-on occasion- I can get a little behind on emails... thank you for your understanding that I am a mom first! But most importantly, thank you for allowing me to use the thing I love (writing) to help me bring in a little extra money to help my family! Did you know that on some posts (like this one), I earn money for each link that you click? For you, it takes just a second, but for me your support allows me to stay home with my children and still make a little extra money on the side. It is a gift that I am truly very thankful for, and I could not do that without all of YOU! So, thank you SO MUCH! I think cloth diapers have come along way & are about as easy to use as disposable ones. This is so super sweet!! Thank you and God bless you during this holiday season and always!! Would love to win this for my baby on the way! Anxious to try cloth diapers! Thanks! I don't believe I've heard of this brand! I love cloth diapering!! I am going on 4.5 years of cding and in desperate need of replacing my stash! lol! I've never tried this brand, but I would love to! 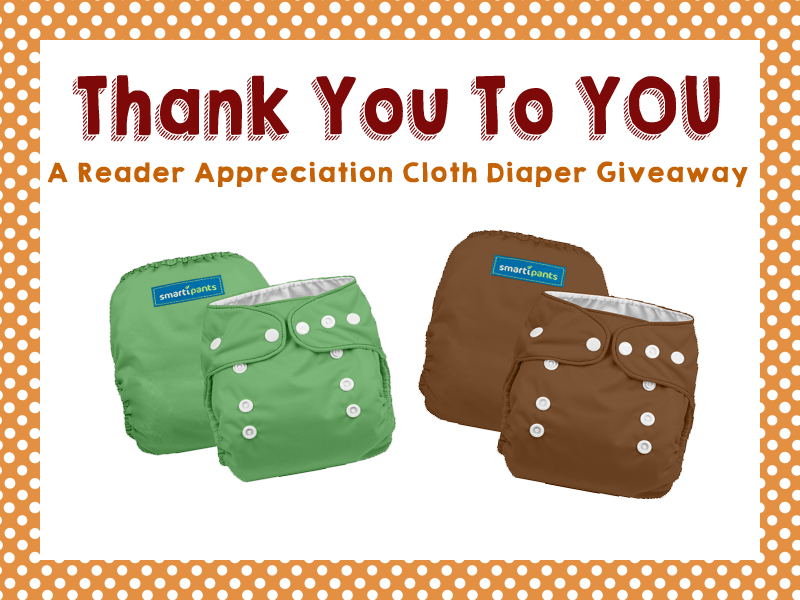 I would love to win these diapers! My husband and I are expecting our first baby in a few months and want to try out different diapers to see which one works for the the best. Thanks for the giveaway! Thank you for the giveaway! I would love to try this brand out! Thank you, as well! I love all your great links, the Christmas card selection is great! thank you for the chance to win. i have never tried a smarty pants diaper and i would love to! happy thanksgiving! I've been cd-ing for 11 months and love it so far! I'm glad I chose to use cloth over disposables with my first and will continue to do so with my next child! I'd love the opportunity to try out these diapers!